Prestashop Stripe Payment with Apple Pay, AliPay, Bitcoin :This is a “One Stop Payment Solution” which allows your customers to pay by stripe card method, digital currency like bitcoin, Alipay of the Alibaba fame, and of course the mobile payment and digital wallet service by Apple - Apple Pay. Explore Apple Pay with Instant Pay feature and impress your customers with varied payments option thus taking the conversion rates to an all time high. Prestashop Stripe Payment with Apple Pay, AliPay, Bitcoin - The need to work with more than one gateway becomes very evident as your business expands. This is a “One Stop Payment Solution” which allows your customers to pay by stripe card method, digital currency like bitcoin, Alipay, and the mobile payment and digital wallet service by Apple - Apple Pay. Explore Apple Pay with Instant Pay feature and impress your customers with varied payments option thus taking the conversion rates to an all time high. Offer multiple payment options to your customers. Admin offers four different payment options for its customers - Stripe Card, Bitcoin, Alipay, ApplePay. Ability to enable/disable any payment option. Admin can enable/disable Instant Pay Option for Apple Pay. 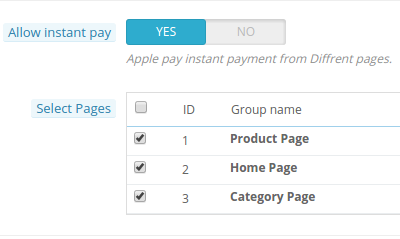 Admin can select on which one or more pages will Instant Pay be available. Module provide three options for Instant pay - Product Page, Home Page, Category Page. One touch payment from Product Page, Home Page and/or Category Page With Apple Pay. Customer will love using Apple Pay because it eliminates all the manual typing work for them. Admin can manage Refund - Fully Or Partially. It is a good idea to have multiple payment options on a website. It facilitates payment and provides various options for the sake of all types of customer groups. This not only enhances store functionalities but also elevate sales since it is helpful for larger mass of customers. Once the module has been successfully installed, there comes a need to configure the details correctly. Admin needs to have their account on Stripe Payment Gateway. Admin can select either Test Mode or Live Mode from the module configuration. 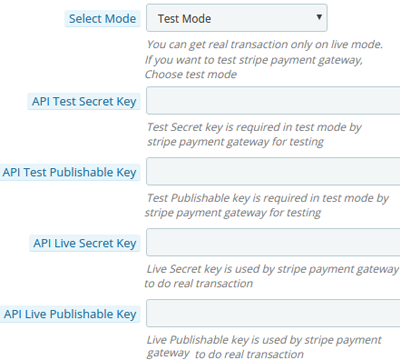 Admin will need – API Secret key and API Publishable key. To make this payment option available, it is mandatory to have at least one card details saved on your apple device from where you are making the transaction. So if the card details are saved on the Apple device, Customer can easily make payment via Apple Pay. Did you buy Prestashop Stripe Payment with Apple Pay, AliPay, Bitcoin?